Has there lived a child in the last fifty years who hasn’t found pleasure singing and acting out the lyrics to “I’m a little teapot, short and stout/ Here is my handle, here is my spout”? Maybe that explains why we find artists of every medium drawn to this intriguing object, with an intent usually focused more on the playful than the practical. I’ve imagined the studio of Rebecca Mazur ( aka Zimmerman), a native of Racine, Wisconsin, as a place where teapots come alive at night and croon this children’s song among themselves. Her forms are so alive and filled with joy, they seem to be the personification of happy tooters. 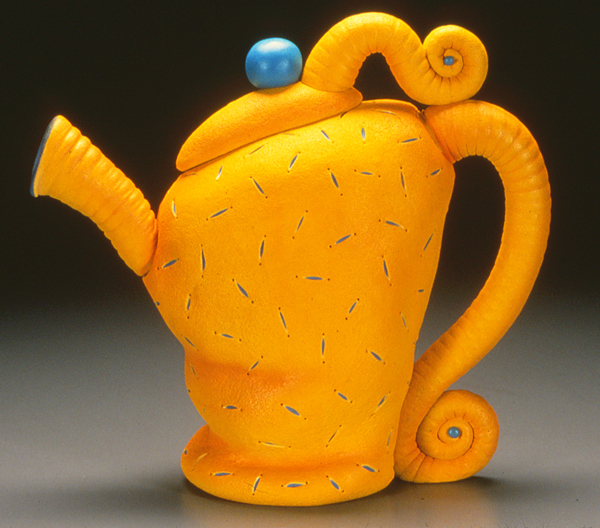 Rebecca, who studied pottery at the University of Wisconsin from 1979-85, began working in polymer nine years later. At first she mostly used caning to create jewelry, sculpture and mosaics. 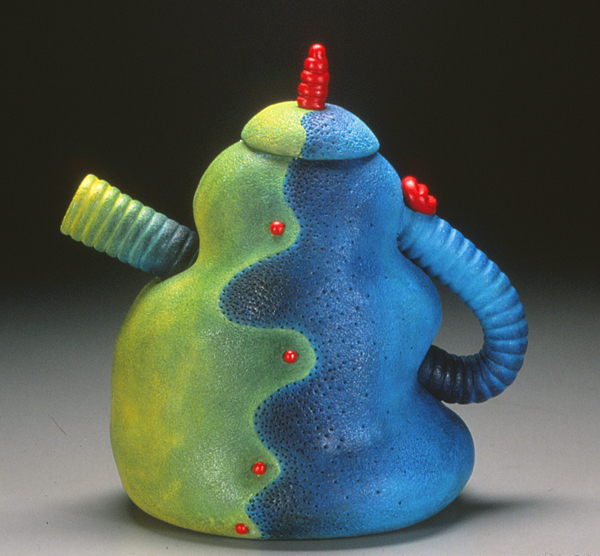 Given her background in pottery, incorporating teapot forms in her repertoire seemed a natural fit. Few artists were working in large scale polymer during this time. That left Rebecca facing the daunting technical challenge of trying to create large hollow forms. Like most of her polymer colleagues during the mid-90s, she had few sources to draw on for technical instruction. So Rebecca, by necessity, had to invent her own techniques and for that she drew upon her training in pottery. To create these soft billowing shapes, Rebecca stitched a sack in the desired shape. She filled each sack with sand and followed by applying polymer sheets over the surface. Then she, in her own playful expression, “plopped” the polymer covered sacks down on her work table creating these pump pillow-like forms. After the teapots were finished and cured, Rebecca cut open the sacks, poured the sand out and removed the fabric. 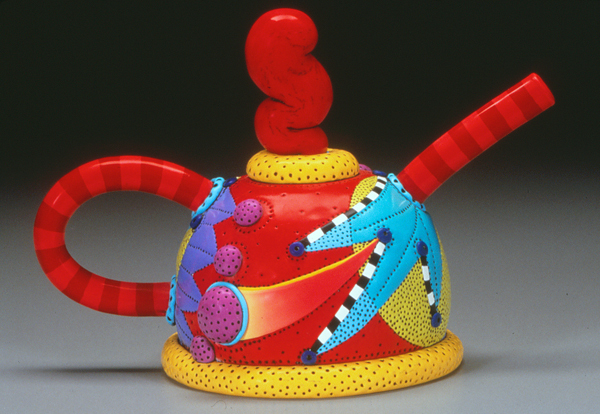 In 1999, Rebecca created this teapot, equally playful, with more graphic embellishments. On our next post you can see how this style evolved in her later works.